The 22oz. Sport Berkey Portable Water bottle is the ideal choice for a personal traveling companion - featuring Berkey's exclusive IONIC ADSORPTION MICRO FILTRATION TECHNOLOGY. The theory behind this innovation is simple. The Sport bottle's filter is designed to reduce or remove many harmful contaminants from questionable sources of water, including remote streams, lakes, stagnant ponds, and sub-standard water supplies in foreign countries where regulations are non-existent or not enforced. 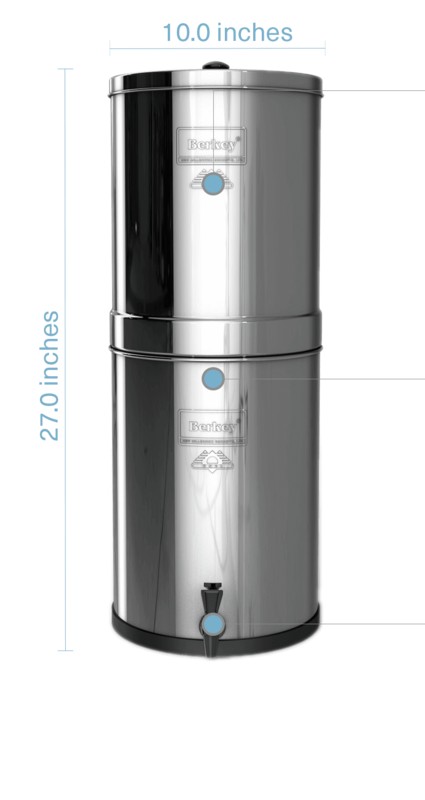 This superior technology used in the Sport Berkey portable water filter was developed, refined, and improved through investigative laboratory testing and field research. Our team of water filter experts, field engineers, and research specialists have developed this purification process over countless hours of testing and research. The media contained in the water filtering element removes contaminants by the surface phenomenon known as "adsorption" which results from the molecular attraction of molecules to the surface of the media. Holding 22 oz. and standing 11" tall and 2.5" wide, the Sport Berkey is the perfect size to take with you anywhere you go. The filter in the Sport Berkey is easily replaceable to ensure you always have filtered water at your fingertips. Each filter has the ability to filter 100 gallons from a municipal water source, and 25 gallons from other water sources. 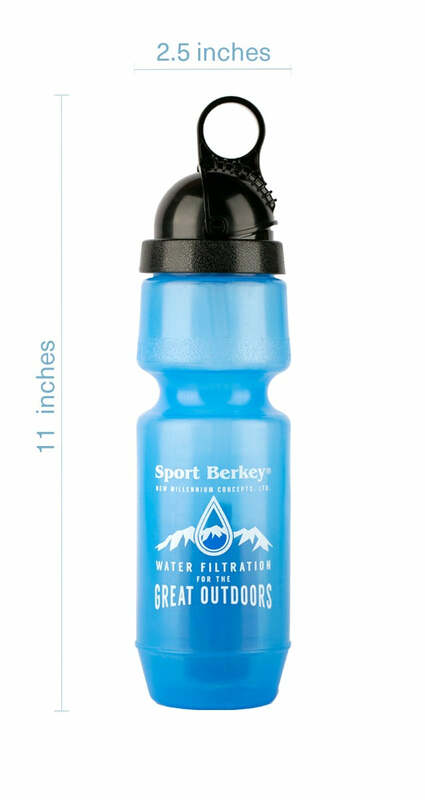 As the Sport Berkey bottle is squeezed, the water is forced through the filter. The density and quality of media used determine the rate of adsorption. The time of exposure through the filter has been carefully calculated to yield the greatest volume removal of toxic chemicals and pollution caused by industry and agriculture. The exclusive filter element of this Sport Bottle is composed of our exclusive proprietary "adsorbing" media that promotes IONIC "adsorption" of pollutants, such as cadmium, chromium, copper, lead, aluminum, mercury, and other dangerous heavy metals. The "Tortuous Path" structure of the Sport Berkey's filter element gives it its unique characteristics. This filter is a true portable Water filter and uses medical grade technology to produce a convenient and portable water filtration system. 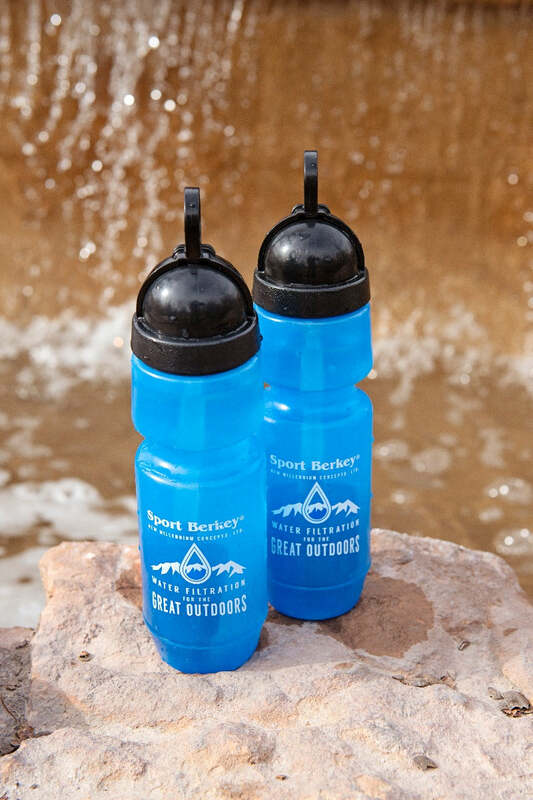 Pour water into the Sport Berkey and securely tighten the cap to eliminate leaks. Pull down the loop on the lid to extend the straw and squeeze the bottle. This will force water through the filter and the straw. Empty as much of the bottle as possible. Repeat this process two times. This process flushes manufacturing dust from the filter. After two flushes, rinse the bottle and cap. Your water bottle is now ready for use! • DO NOT carry bottles containing liquid in bags to help prevent accidental opening. • 50/50 mixture of 3% Hydrogen Peroxide and water. Once the bottle has been flushed, rinse with water. Allow all parts to thoroughly air dry before re-assembling. Seal the bottle in an airtight container if possible. Do not allow the filter to freeze. Freezing can damage the filter and will require replacement. This filter is not microwave safe and is not designed to filter water hotter than 95º F.